Architects gaze at the urban landscape in a rather specialized way – often forgetting that there are other ways of looking at the city. Three magazines recently added to my still inexplicably growing collection of new periodicals suggest three peculiar ways to engage with the contemporary urbe. As the name suggests, Grey looks at the urban as grey matter. Not the brainy stuff, but the concrete one. And even if one short story in the first issue of the little free mag is called The Brutalist, concrete isn’t here because of a particular infatuation with the modernist building material with which politicians, contractors and most architects would love to dress up every bit of our cities. Boneshaker mag, on the other foot, looks at the city through its “bumps” and “jolts”, its “rides” and “routes”, its “flows” and “lanes.” In this case the protagonist is the bicycle, and the new pro-sustainable, politicized leisure culture, and all other cycling trivialities that surround this old smooth operator. Boneshaker is a quarterly coming from Bristol, and its first issue certainly aimed at producing enlightenment on every aspect of bicycology – from the story of your local repair workshop to rallies in L.A., from H.G. Wells or Conan Doyle two-wheeled quotes to a touching story on how to take your turns in an aggressive urban environment such as Guatemala City. As for Car Park, you would by now expect that it too would be dedicated to all-democratically celebrate car culture and the way we look at cities from behind the wheel rather than on top of them. But nope. Here, finally, the title is misleading and we are rather looking at a more traditional publication that carries the sort of black-and-white photos of gritty-looking cityscapes that have always made the joys of so many filmmakers. Suddenly and weirdly, however, it’s the nice, grainy, and sharp avant-garde gaze that comes across as old-fashioned and slightly out of place in regards to the prosaic metropolitan reality of today’s new city cultures. There was a year in my life in which I would wake up every day at 11.37am. As if possessed by an internal alarm clock, I would always be pulled out of my sleep at precisely 11.37am. There was a reason for it. Every morning, there was this luxurious radio show that would broadcast a full music LP. Unlike many of today’s play-lists, the long-play was taken in as a coherent whole, an articulate soundscape. The radio show was called Interiors. After a few words of introduction, day after day, one was allowed to enter another unexpected, personal inner landscape. The Interiores exhibition is coming to an end this coming Saturday – with the corresponding limited edition book set for December. Today I’m also doing a one-day installation, The Golden Temple, part of the ongoing EMPTY CUBE project that, in this instance, runs parallel to the Lisbon Architecture Triennale. So, it’s a good moment for a sort of mid-term assessment. As the wanted ambiguities of one’s own work become the subject of scrutiny, and as the focus shifts from talking about others to talking about oneself, there is a thin line that is forever broken. So let’s take that thread up. In the scope of curatorial or critical activity – which Ethel Baraona Pohl just readdressed when referring to my recent Abitare article – you are expected to maintain a certain distance from your subject. My position, however, is that today one can be so entangled in different modes of activity, that this distance becomes truly impossible. And this is potentially not that bad. The growing relevance of the social networks – which simply make transparent the rules that were already in place in any competitive cultural game – only adds to the impossibility. Against the progression of technical specialization, cultural personas can no longer be contained in the straightjacket of a single position. If I have always claimed the right to contradiction, and if I have more recently reclaimed the return of operative criticism – revisiting Banham’s immersive openness as opposed to Tafuri’s historical dead ends – I must now re-embrace the strange, ridiculous notion of the one-man band. As I’ve done in my conference last week at the BIArch, in Barcelona. Being a one-man band is hard. Doing too many different things is considered a personal offense to many people. But this notion can be useful, especially if one thinks that digital and communication technologies, rather than merely supporting a formal language, modify the way we operate. They provoke alterations both at the physiological and professional level. Think of Mathew Herbert. Being a one-man band today simply means that you can instantly outsource all your needs and, without the burden of a large band or office, you may assume control of many different creative processes happening at the same time. Collaborations, cheap telecommunications, digital capacity are the tools that allow for this creative multitasking. And then, wonderful things like this may happen. This is why I think that, today, embracing apparently contradictory activities may be enriching. And this may be enriching as precisely the opposite of being superficial – like in “not going deep enough into a specific matter,” as contesters of interdisciplinarity would immediately and joyfully claim. If different activities indeed constantly feed on each other – as has been the case of artists that pursue diverse formal or methodological strategies – the complexity of the oeuvre comes out of the fuzzy superimposition of the different tasks being performed, and not at all from the value of a single work. Allowing yourself, on top of this, to also publicize your own self-enquiries may be deemed somewhat dubious, if not simply egocentric. But, isn’t it the advantage of the new wiki mindscape that any line of enquiry should be pursued so as to contribute to general knowledge? As Interiores is coming to its end, and even if it its contents will live on as a special publication, this is the right moment to face up to the potential divide that may come up between what I make and what I write. Do as I say, not as I do. This maxim, as it usually happens, is not the product of popular knowledge, but the remnant of a refined intellectual critique on hypocrisy. One that can be traced back from the New Testament right into John Selden’s “Table-Talk” back in 1689. As I’ve been recently dubbed a moralist, and as I myself like to quote a once old friend as not wanting to preach to the converted, I guess I should go back to the core of this dictum and reflect upon a few things. And I should do it for one simple reason: while I constantly preach for diversity and contamination – and even occasionally for an aesthetical shift towards the “ugly” – my architecture work sometimes feels too slick and polished. It’s almost as if I wouldn’t know how to do otherwise. However, the conceptual operations that lay behind the creation of these spatial interventions – objects with which I invade existing places – are certainly becoming more hybrid and trying to avoid the repetition of basic formalist traps. If they represent some form of minimalism – when I’ve frequently raged against minimalist chic – it’s only because they eventually intend go back to the crux of minimalism as this was once described by Hal Foster. And then again, they willfully blend with other cultural strategies, such as pop or fiction. These interventions want to create disturbance, rather than just accommodating need. And the fact that collaborations are also involved in the presentation of these projects means that further contamination is to be added to their intrinsic invention, originating new critical layers. João Paulo Feliciano, Around the House (Daft Punk is in my House), 2002-10. Doing interior architecture has become more and more of a political project, and one that goes along critical curatorial practices and writing itself. In this sense, what I do does echo what I say, but within a distorted aesthetic arena that is an integral part of a practice research into both ethics and aesthetics. I recycle existing spaces, I revive them through new narratives, just as I claim that architects should be the first to tell western society to stop building anew in yet untaken territory. And I believe those acts of recycling can again be an arena in which architects again assert an artistic and political stance. In the middle of an arresting institutional crisis, one must find ways to still exercise one’s acquired knowledge. As such, as Brazilian singer and poet Chico Buarque once sung in the beautiful and subversive “A Good Advice”, one provocation comes to mind: do as I say, do as I do, act twice before you think. Maurizio Cattelan, “L.O.V.E”, 2010. Image via Designboom. Footnote #3 to the essay “The off-modern mirror,” by Svletana Boym. As I’m about to leave for a solo conference at BIArch – and one that amazingly succeeds to an artist that I deeply admire, Vitto Acconci – I realize that my regular coming back to Barcelona these days feels like the pleasurable restart of a relationship with someone that has long been absent. After participating at the EME3 International Architecture Festival, it also happened that I was invited as an independent nominator to choose five works of European architecture to compete for the 2011 edition of the Barcelona-based Mies van der Rohe Award. I think by now I am allowed to reveal my picks. I selected works that I consider most revealing of unexpected ways to deal with architecture, within so much that has been produced over the last couple of years. It’s an idiosyncratic curatorial choice, but that’s what I guess an independent outlook should always care to be. 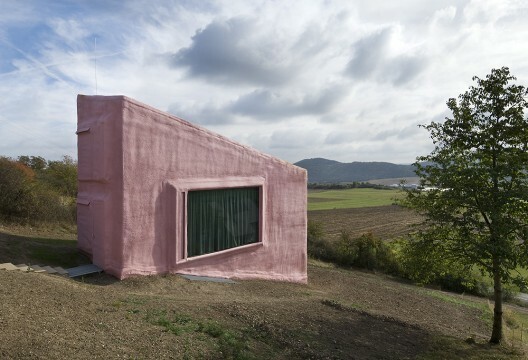 The Truffle is a project by Antón Garcia-Abril/Ensamble Studio in Costa da Morte, Spain. Following on radical experiments like the Hemerescopium House, this is yet another project in which unique processes and investigation turn into a powerful statement on current conditions for architecture. Namely, La Trufa explores unexpected means to conceive sustainability and the realization of architectural concepts. This is one situation in which scale doesn’t minimize the emergence of a radical architecture gesture. The House in Never-Never Land by Andrés Jaque is a research into a new ecologically driven architectural design, and one that originally integrates concepts like self-sufficient waste treatment, or compensation for land use. But it also bears the quality of continuing the tradition of those architectural avant-gardes that were long ago subsumed by the most sterile forms of modernism. In such instance, Archigram’s Walking Cities or Banham’s A Home is not a House may come to mind, while the mechanical language is driven into subtle political stances on hedonism and the current economic status. HSH architekti’s Vila Hermína departs from an apparently primeval premise – an ugly box that offers itself as a drastic constructive and contextual assertion. As such, it then moves forward to propose an extraordinary revision of domestic spatiality out of the contradictory demands of client and program. A single, modest object half lost in the middle of the Czech landscape is able to fully disrupt many of the conventions that still dominate the production and reception of contemporary architecture. And this represents the remaking of the discipline on the go, namely as a bold and ironic contribution to contemporary popular and vernacular culture. The Jellyfish Theatre, now dismantled, was “London’s first fully-functioning theatre made entirely from recycled and reclaimed materials.” Although with a temporary project, Berlin-based Köbberling and Kaltwasser brought a new aesthetics to the main centers of architectural diffusion and debate. Stemming from the researches of artists such as Tadashi Kawamata or of architectural units such as the Rural Studio, this is an important public acknowledgement of how the interdisciplinary practice of architecture can create critical awareness regarding a crisis of resources that is only at its early dawn. Last but not least, a Portuguese project. 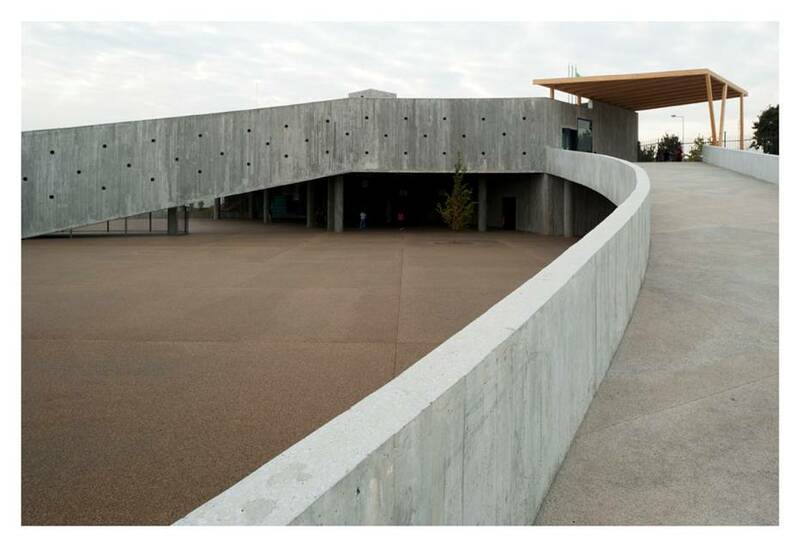 In a moment in which Portugal updates its public school buildings’ network, aNC arquitectos proposed an addition to an existing school in Leça do Balio that both reorganizes spaces and gives new meaning to the previous layout. Conversely, the project also suggests a reflection on how to handle existing material and cultural resources. On one hand, current economical restraints impose a more energetic creativity so as to maintain architectural quality. On the other hand, architectural languages themselves have to be revisited and reordered so as to accommodate new hybrid identities with a high degree of comfort and playfulness. Like music, now also architecture culture is to be the object of a permanent practice of remix.